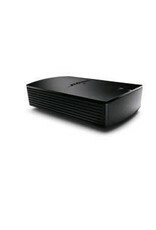 With the Bose SoundTouch® SA 5 amplifier, you can add your speakers and experience a world of wireless music. Easily. The 100W SA 5 amplifier is part of an entire family of Bose products for every room of your home that lets you explore, organise and easily play your favorite music. The SA 5 amplifier also has Bluetooth® connectivity and three aux inputs.